Amid the frenzy of worldwide research on atomically thin materials like graphene, there is one area that has eluded any systematic analysis—even though this information could be crucial to a host of potential applications, including desalination, DNA sequencing, and devices for quantum communications and computation systems. That missing information has to do with the kinds of minuscule defects, or "holes," that form in these 2-D sheets when some atoms are missing from the material's crystal lattice. "It's been a longstanding problem in the graphene field, what we call the isomer cataloging problem for nanopores," Strano says. For those who want to use graphene or similar two-dimensional, sheet-like materials for applications including chemical separation or filtration, he says, "we just need to understand the kinds of atomic defects that can occur," compared to the vastly larger number that are never seen. 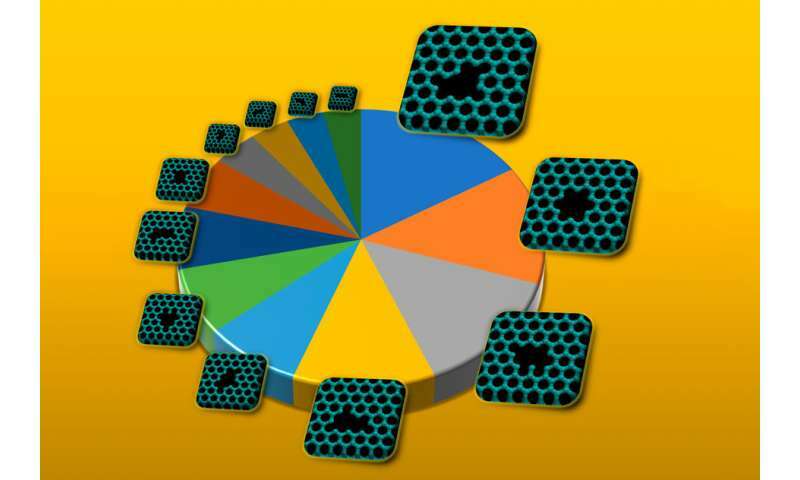 For example, Blankschtein points out, by removing just eight contiguous carbon atoms from the hexagonal chicken-wire-like array of atoms in graphene, there are 66 different possible shapes that the resulting hole could have. When the number of atoms removed increases to 12, the number of possible shapes jumps to 3,226, and with 30 atoms removed, there are 400 billion possibilities—a number far beyond any reasonable possibility of simulation and analysis. Yet only a handful of these shapes are actually found in experiments, so the ability to predict which ones really occur could be of great use to researchers. The ability to do the analysis relied on a number of tools that simply weren't available previously. "You could not have solved this problem 10 years ago," Strano says. But now, with the use of tools including chemical graph theory, accurate electronic-structure calculations, and high-resolution scanning transmission electron microscopy, the researchers have captured images of the defects showing the exact positions of the individual atoms. In addition to their impact on a material's mechanical properties, holes affect electronic, magnetic, and optical characteristics as well, Govind Rajan says. "We think that this work will constitute a valuable tool" for research on defects in 2-D materials, Strano predicts, because it will allow researchers to home in on promising types of defects instead of having to sort through countless theoretically possible shapes "that you don't care about at all, because they are so improbable they'll never form."